St. John Coral Bay is a favorite destination on our Caribbean island. This flourishing area features a variety of relaxing beaches and delicious restaurants. Yet, it is a little quieter and more secluded than the bustling main village of Cruz Bay. When visiting St. John Coral Bay, you will discover gorgeous hills overlooking the Caribbean Sea. Along with sailors who live on their boats in the Coral Bay St. John harbor, donkeys, goats, and mongoose also call Coral Bay home. Discover the quirky “other town” on the island when you explore St. John Coral Bay! To discover even more great attractions in Coral Bay St. John, download our app. Here at CimmaronStJohn, we strive to make your vacation planning as easy as possible. When you download our app, you will have access to our recommended beaches, restaurants, eco-tours, and more around the island! There are some beautiful beaches that you can access on the South Shore of St. John near Coral Bay. Salt Pond Bay is one of our favorite secluded white sand stretches. With a short hike to the water, plenty of sunshine, and ample space to spread out, this is a great relaxing destination. You will also have access to the Drunk Bay and Ram’s Head Trail from Salt Pond Bay, and there is excellent snorkeling along the rocky bay edges. Another great beach near St. John Coral Bay is Little Lameshur. For visitors who want to get away from it all, this isolated sandy stretch is the place to go. Little Lameshur is the second of only two sandy, South Shore facing beaches in the National Park. Healthy coral teeming with a variety of sea life separates Little and Great Lameshur and will delight snorkelers! Undisturbed by locals and tourists, Grootpan Bay is a mixture of sand and rock, easy to access, and caters to those looking for solitude. The center to eastern part of the bay provides the best snorkeling, and the remoteness of the bay has enabled sea life to remain abundant and undisturbed. Grootpan Bay is also an easy walk from one of our deluxe rental properties called La Sirena. One of our favorite things to do in Coral Bay St. John is eat! There are some delicious culinary havens in the area, and one of the best is Aqua Bistro. This casual dining restaurant features a relaxed but elegant ambiance as well as a great outdoor courtyard. A tiki hut outdoor bar and views across Coral Bay are just a few draws to this favorite St. John Coral Bay eatery. After spending a morning at Salt Pond Bay, a great lunch destination is Cafe Concordia. This casual St. John Coral Bay restaurant features a beautiful outdoor dining space overlooking the bay. Along with stunning views, there is a well-renowned menu. There is also an open mic night on Mondays if you’re looking for something to do! Shipwreck Landing is a great dinner option that features a friendly atmosphere with a cool breeze. Enjoy specialties such as the stuffed crab, grilled rib eye steak, and curry-nut crusted chicken. Frozen cocktails are also a favorite go-to here. Choose from the raspberry mango colada, passionfruit daiquiri, or golden margarita, among others. At two-bedroom, two-and-a-half-bath Villa Jumbie, Cathedral-style ceilings adorned with open beams and stained cypress cover the entire great room. The kitchen and dining areas allow unrestricted sliding glass views of Coral Bay Harbor and gorgeous surrounding valley and mountain scenes. Exiting through the dining area or great room sliding doors will bring you to the beautiful covered portion of the wraparound deck. Here, you will enjoy casual seating for enjoying the harbor views or relaxing with a good book while basking in the cooling tropical breezes. Villa Jumbie’s location is such that you can watch the sun and moon come up over the pool and spend hours looking at the incredible star fields at night. During the daytime, you can enjoy watching colorful Hummingbirds and Bananaquits frolicking around the deck feeders. 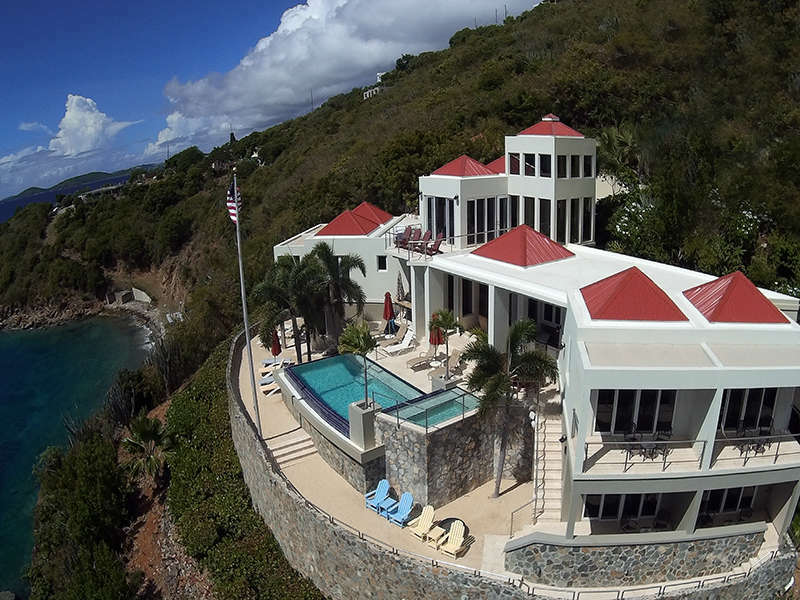 Only 15-20 minutes from many of our world famous beaches and the Virgin Islands National Park, Villa Jumbie offers a fabulous location for a truly memorable vacation on St. John!